I definitely like the J.Crew option better, it seems more delicate or something. But I think the Old Navy version is a good budget option. 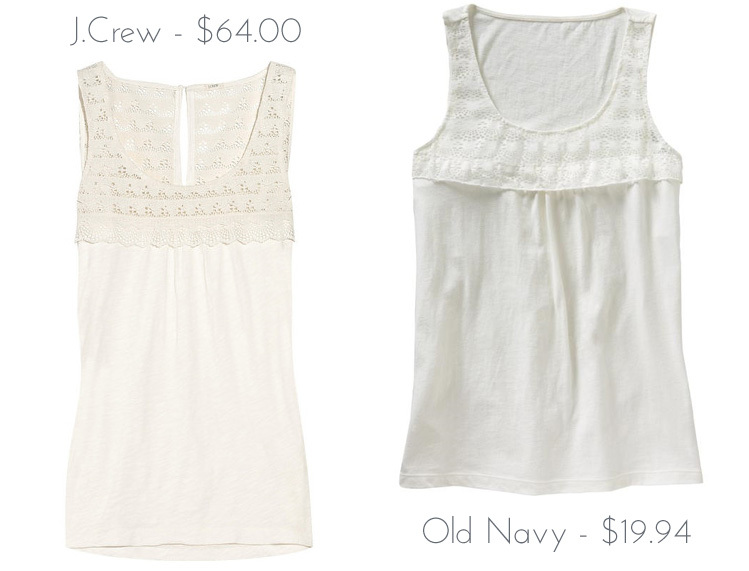 I think you're right about the J.Crew one having better execution but that won't stop me from getting the Old Navy one. Great find! This is why I can never justify buying a shirt for over $30! You can always find it cheaper! I got really lucky and scored the J. Crew one for $14.99 at an additional 30% clearance in store. Sometimes their deals are really great! Definitely a couple of things I like better abou tthe J.Crew (length and fabric quality), might be worth the extra if it is a staple to your wardrobe vs. something you would wear only once in awhile??? Great cheap alternative though! I'm with you! I love the J Crew option, but that ON option sure is cute! From the pictures, it's hard to tell a big difference but I always feel like my Old Navy clothes always seem to age much faster than J.crew ones. Either way, both tops are great!